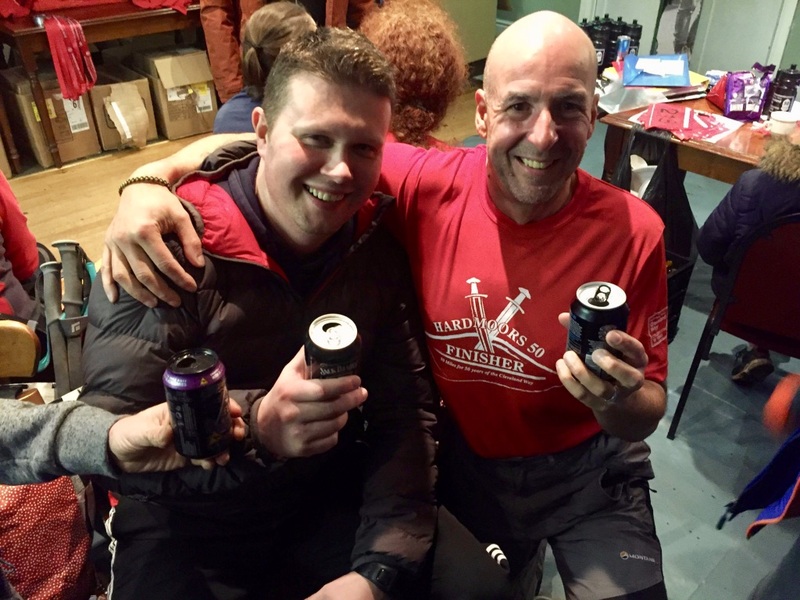 “I want to get to the end and feel I’ve enough in me to turn around and head back,” said Phil Owen as we chatted at race HQ in Guisborough Rugby Club. 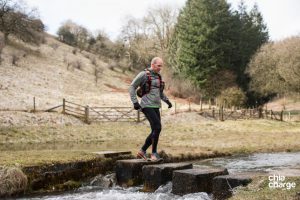 For many, running an ultra of 55 miles is simply incomprehensible, but for Phil, this was merely preparation for the Hardmoors 110 later this year, and that is a distance beyond even my imagination can stretch to. At this point the weather took a turn pelting us with snow and rain but it didn’t last long and as we gained height up into Guisborough woods a wonderful rainbow appeared. Russ and I maintained a steady pace as more people continued to stream past us as we made our way to Roseberry Topping for the first really big climb of the day. The field was well stretched at this point as we headed out and back to the summit check point. On the climb back up to the gate I’m greeted by the shout of “elite athlete coming through!” as Phil surges in the opposite direction followed by Anna tentatively making her way down behind him. 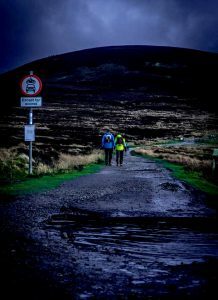 I ran this last year in very good weather and it was an enjoyable if tiring day out on the North York Moors. I was very kindly given a lift by Andrew Thompsons’ dad. This saved me the struggle of getting my two boys out of bed and the ongoing complaint of spending weekends in muddy fields waiting for me to finish yet another race. At 9am off we went and for the first couple of miles the path was fairly congested. 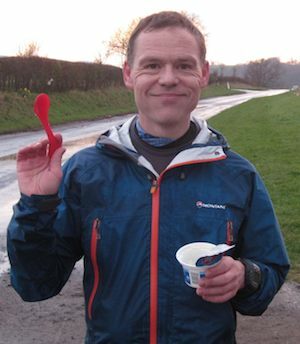 By Rievaulx Abbey I was into my rhythm and having a good natter with my fellow runners. One thing about these races there is no shortage of people to chat to in the middle of the pack. I’m not sure what the proper runners at the front do? I made the first checkpoint at the white horse (not a pub) in good order. My legs felt good and I was moving quite well. I hadn’t been able to train for a few weeks due to Sciatic problems so was feeling a bit uncertain as to whether I would stay the distance. 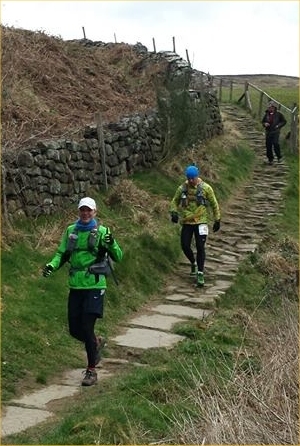 We got into a decent running pace and passed Lordstones Cafe in good order. On the way up Cringle Moor David got cramp I did offer a leg massage but the look on his face said it all. He ordered me to “push on” or was it “push off”? I ran much of this final 12 miles or so on my own. A few of us linked up when it got dark coming off Roseberry topping and this always helps when your tired and it’s dark. Very easy to lose concentration and get lost. The clouds parted as we ran along the disused train line into Guisborough the night sky looked glorious. We got a round of applause (and curry) at the sea cadets hut when we finished. David came in not long after me which was great. Judging by the grin on his face I think he was rather chuffed with himself. 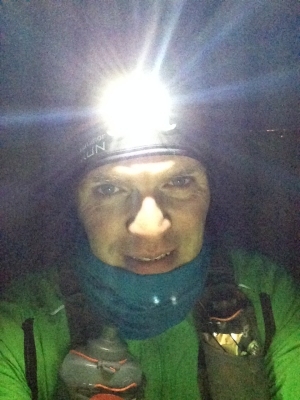 Unfortunately Andrew took a wrong turn in the dark after coming off Roseberry Topping and didn’t finish which was a real shame as he was certainly well within the time at that point. Maybe next year? 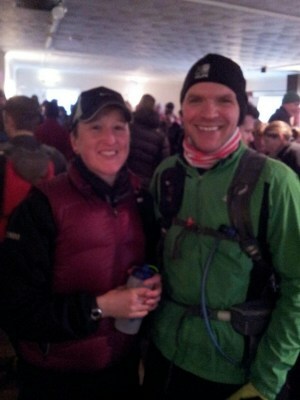 I later heard that Phil and Anna had a bit of an epic after Anna had a slip and bashed her knee. 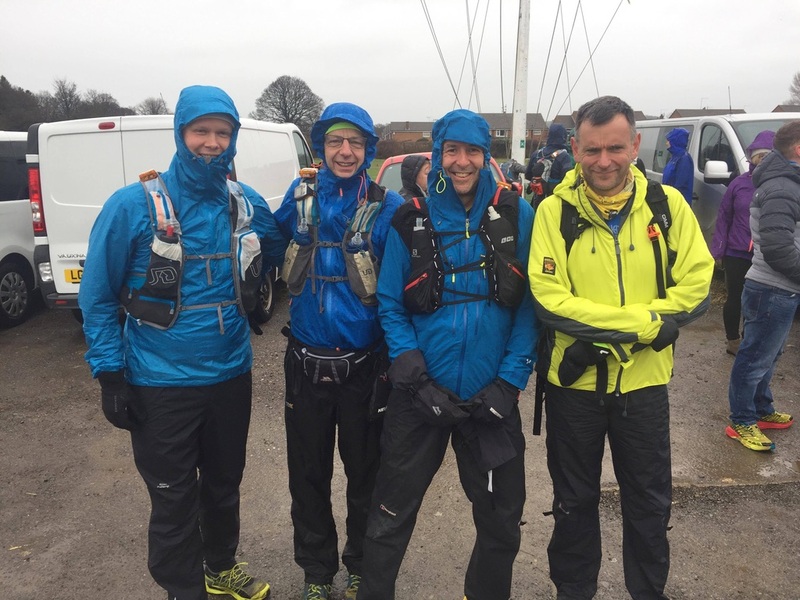 They still finished within the time limits so it’s a well done to them for keeping going. As for me I might be back I would really love to get in under 11 hours, who knows? 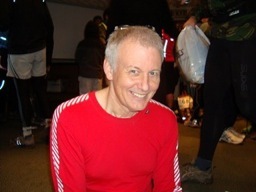 “I’ve never seen so many old gadgies in lycra” were my wife Joan’s comments as I got organised before the final briefing for the Hardmoors 55. 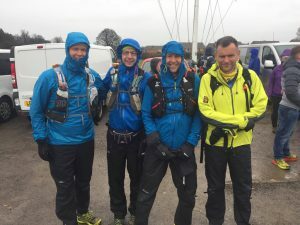 We were stood in front of the pavilion at Helmsley football club at 8.50 and received our final talk prior to the start at 9am. 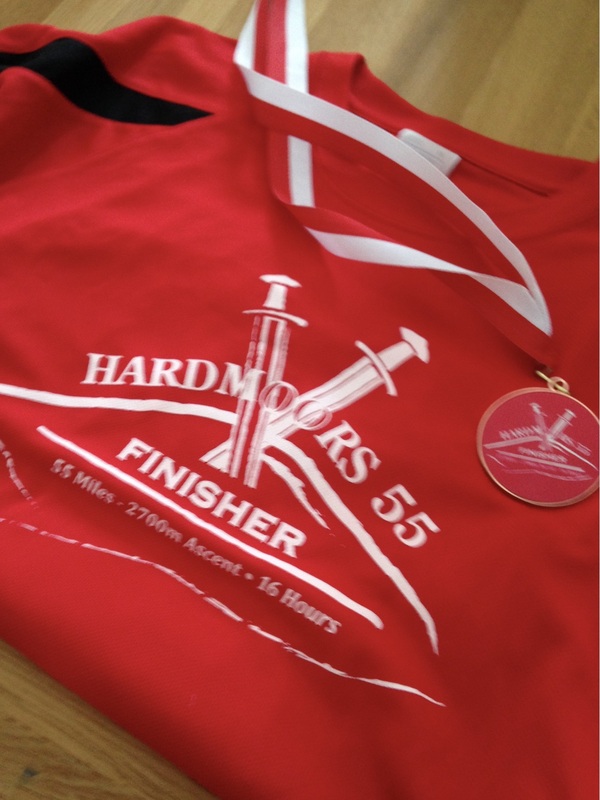 My main aim for this was to get round as the longest single distance I’ve run since the Lakeland 50 was 19 miles. I was feeling decidedly under prepared! The weather was absolutely fantastic and as we ran past Riveaux Abbey I felt warm and relaxed in the early morning sun. 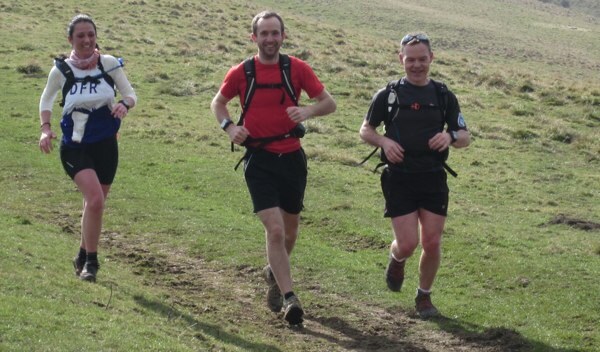 I was running along with Andy a guy from DFR and a very good fell runner. He introduced me to Dawn another DFR member this was her first ultra. 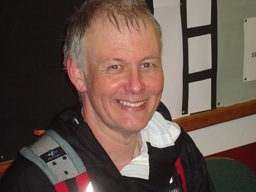 The first 9 miles to Checkpoint 1 at Sutton Bank White Horse passed in no time at all and as we were nearing the White Horse the race leader came whizzing back along the escarpment we shouted well done and went down the steps to get our first clip. I’ve walked most of the route which follows the Cleveland Way on a few occasions which was handy as I managed to lose all my photo copied maps which I’d carefully marked out at the 14 mile mark past Sneck Yate Road. 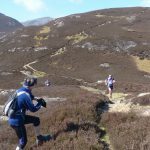 At this point Andy ran off with Jim, another exceptional DFR runner who came flying past after starting at 9.30am with the sub 9 hour runners. 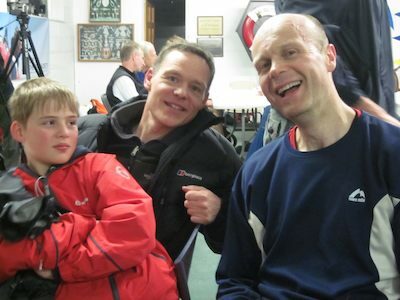 Incidentally Andy would finish in 8th and Jim in 4th. 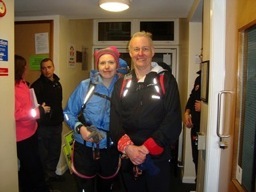 I continued my steady plod with Dawn and we got to Osmotherley in good shape and pretty good time. 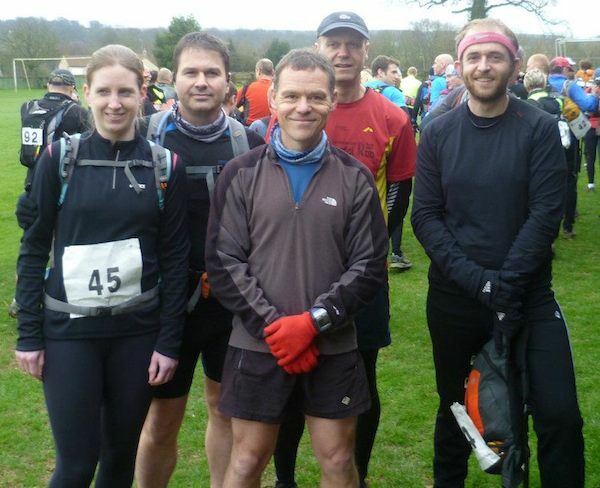 I got a big well done from our very own Dave Robson who was marshalling the early part of the race. We were ushered into the village hall where our first drop bags were, I grabbed a couple of drinks changed my running top and we were soon off. I could have murdered a cup of tea but alas there seemed to be none on offer. It’s very easy to dawdle at checkpoints so I made sure we got moving, even so my legs had stiffened even in the 5 minutes or so while I was sat down! The weather was still lovely sunny with a light breeze wow! We went through checkpoint 3 just out of Osmotherley this was a last minute addition to stop naughty runners taking a short cut up the road, tut tut. 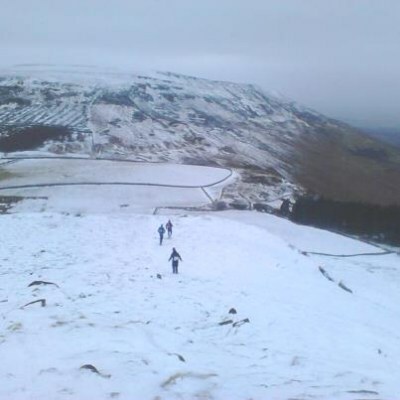 We got some great views and some really nice running over Carlton Bank, Cringle Moor and the Wainstones. At Clay Bank road crossing Joan greeted us with a big hello and lots of encouragement she also had some extra drinks which were a real boost and more importantly a new map and strict instructions not to lose it. We were past the 30 mile mark and every mile seemed like double the distance so I decided to stop looking at my Garmin. 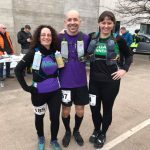 We managed to take a wrong turn at Tidy Brown Hill and lost a fair bit of height added half a mile and lost a good 7 places which is not what you want on a long race ahh! Joan was there at Kildale which was the second bag drop. I didn’t have a second bag and neither did Dawn so we got through the checkpoint really quick making up all the places that we’d lost. Dawn met a couple of her DFR buddies before Captain Cooks Monument and this was an extra boost for her. We had a great run over to Roseberry topping making up some more places and got a wonderful view of the massive orange full moon. 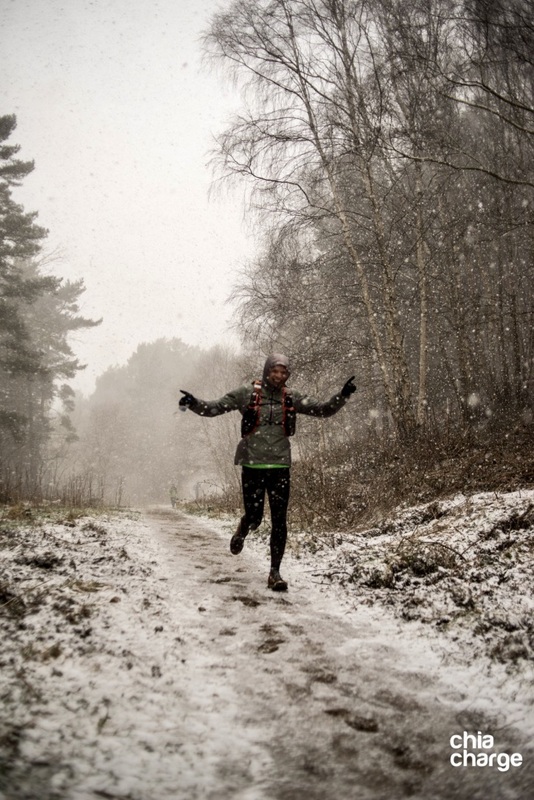 It finally got dark as we ran through Guisborough woods and my legs were starting to feel tight on the down hills. The final down hill was on a concrete path then it was a long mile back along the disused railway to Guisborough rugby club. 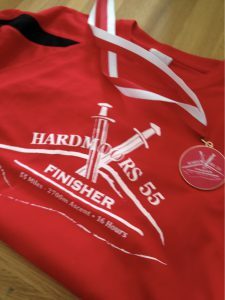 10 hrs and 57minutes of very pleasant running. Dawn came in just after me and grabbed 3rd place! 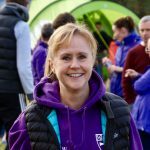 I was concerned about doing a race which would be 21m longer than I have ever done before. 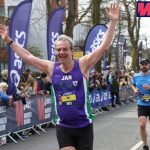 Doing a gentle marathon six days before was also worrying me, would it have any effect ? It turned out it didn’t which was a relief. I was also worrying about running on my own in the bad weather that was forecast, I find it helps to have company when the weather is bad. Luckily, I joined up with another runner at 22m and ran the next 32m with her. I don’t think I would have completed it on my own. My equipment worked very well. 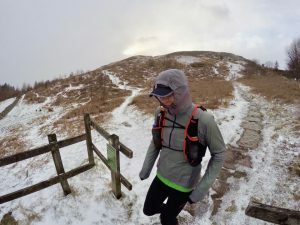 Ran in Helly Hensen base layer, OMM Kamleiker waterproof top, Gore tights, Inov-8 roclites and a Raidlight Endurace back pack. I made a basic error at the start by running in road shoes. It is said you can do the Cleveland Way in road shoes and that might be okay in a dry conditions, but they weren’t that today as I discovered pretty quickly :-O. Luckily the first car access point was at 5m so I changed into the Roclites then. I also started with gloves that were way too thin for the conditions on the tops. My worst time was when it was sheeting down with rain and my hands got cold. Again a car access point saved me and I changed into fleece gloves. However, in the final stages in the frosty conditions, my hands were getting very cold even with those gloves. The route was basically along the Cleveland Way from Helmsley to Guisborough woods where it then cut back to Guisborough. There are moors, woods, lots of hills, some of some big long climbs, all of which I walked up. Had to walk some the descents too because of the steepness and rocky paths. Two out and back sections at the White Horse and at Roseberry Topping. 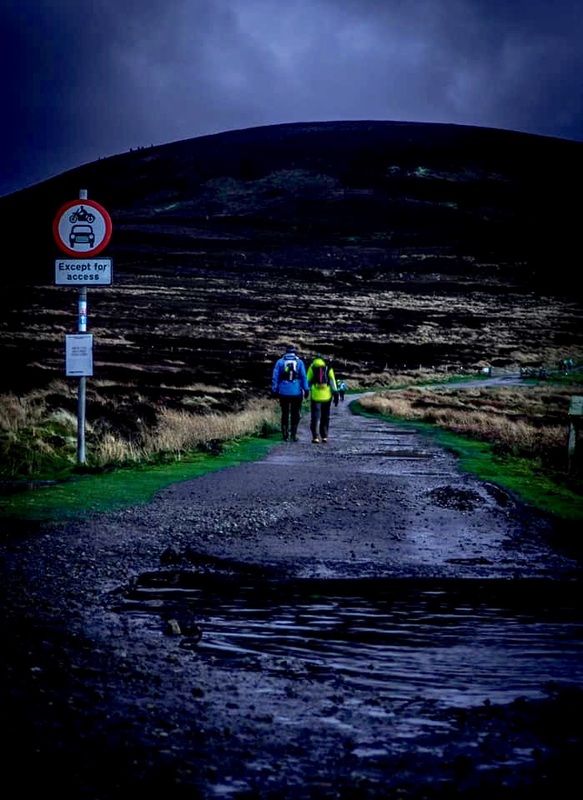 Because it’s a route for walkers mainly and to save it becoming a quagmire, the park authority have put in a lot of large rock slabs which can be slippery and lots of assorted rocks on the ascents and descents. I could not find anyway of running down these safely. I felt I would cause serious damage if I fell on to those rocks. The uneven rocks in the path up and down Roseberry Topping were particularly tough especially with a head torch. There were sometimes fell runner alternatives to these paths, but they were often slippery.